We bet you have done this in your childhood – tried to get rid of the green peas and mashed potatoes from your plate by feeding them to the greedy dog or tossing them onto your sibling’s plate when they weren’t watching. But once you grow up, nothing seems to be easier and more filling than a bowl of buttered peas for a lazy weekday dinner. Peas are truly one of the most versatile veggies. You can braise them, puree them, add them to pasta or stir-fry dishes, or simply enjoy them raw in a salad. Even when it’s the pea-k season, peas are fairly sensitive to temperatures and their natural sugar quickly turns into starch, making them taste bland. But if you know how to store green peas the right way, you can enjoy them year-round. Here are two easy-peasy ways you can store your harvest, both for a short time (3 to 5 days) and for a year-long supply, without the use of preservatives. Fresh peas need to be refrigerated as soon as you bring them home. Heat, even at room temperature, will quickly turn the sugar present in peas into starch and take away the mild sweetness. 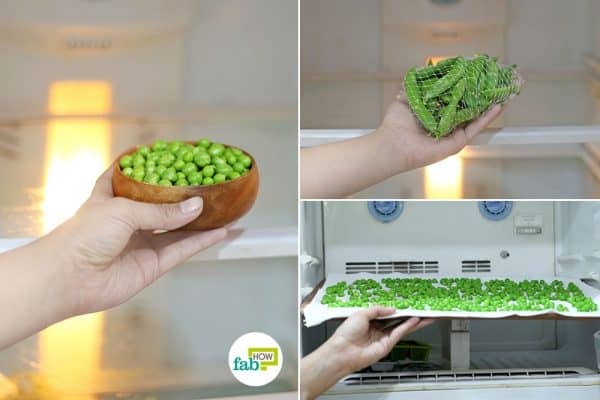 You can store the peas whole or shelled in the refrigerator. If you are in a hurry, refrigerate them whole. However, the better option is to shell them first and then refrigerate, so your peas are ready when it is time to cook. Sort out the green and firm pods from the lot. Discard any that have turned yellow or whitish, as well as any that are wilting or developing mold. Close one end of the mesh bag with a twist tie. 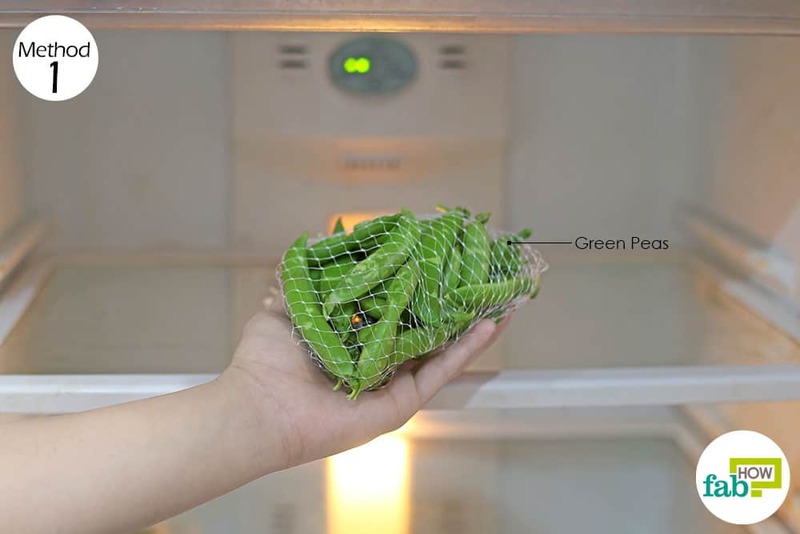 Put all the pea pods in the mesh bag, and secure the other end with a rubber band or another twist tie. Place the mesh bag in the fresh zone or crisper in your refrigerator until needed. 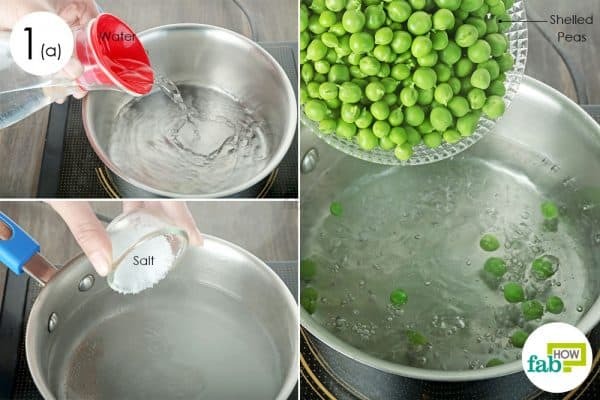 Your peas will stay good for 3 to 5 days using this method. Sort out the fresh pods from the lot. Shell all the green and firm pods. To shell them quickly, break off the stem at the end of the pod, then peel the thread-like fiber from the seam to open the pod. 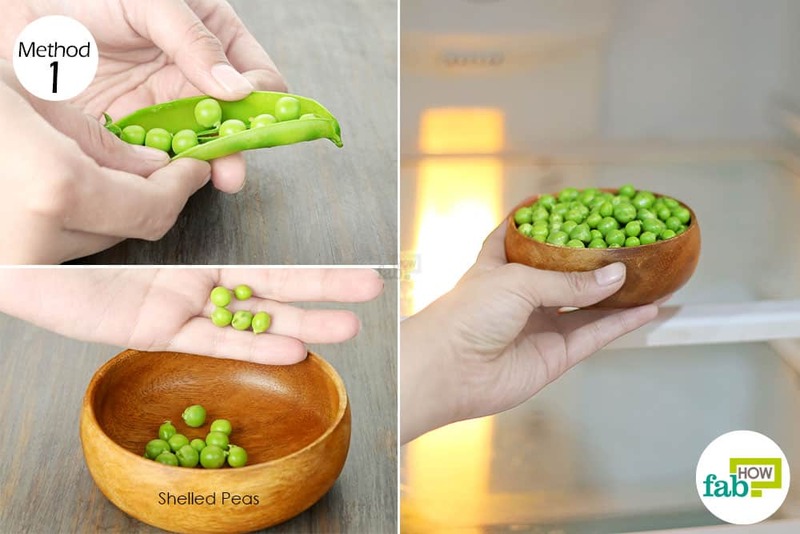 Use your thumb to push out the peas into a bowl. 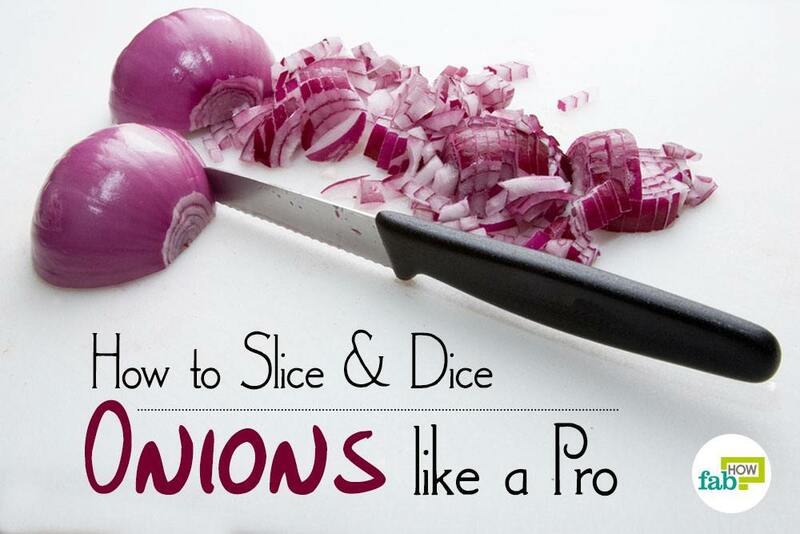 Place the bowl in the fresh zone or crisper in your refrigerator. You can store green peas for 3 to 5 days this way. While storing peas whole or shelled is okay for a short time, wouldn’t it be nice to have a year-round supply for your soups and stir-fries? To do so, you’ll need to blanch and freeze the sweet peas. Additionally, you can also use this technique to store celery or to preserve carrots. Blanching involves boiling the peas on high heat to kill the aging enzymes and then plunging them into cool water to stop the cooking process. It enables the peas to retain their texture, flavor and nutritional value to a large extent. 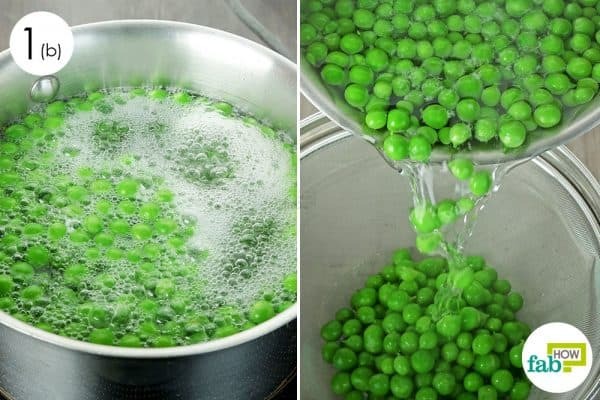 While you can easily buy frozen peas from the supermarket, they often contain artificial coloring (that gives them a bright green color) and vinegar for preservation. While home-preserved peas will be a little paler, you can rest assured that your family is not eating unnecessary artificial colors and preservatives. Fill a medium-sized saucepan halfway with distilled water. It is best to use distilled or filtered water, as it is free of impurities and will increase the shelf life of the peas. Add 1 tablespoon of table salt. The salt prevents the nutrients in the peas from leeching out into the cooking water. It will also help kill any germs. 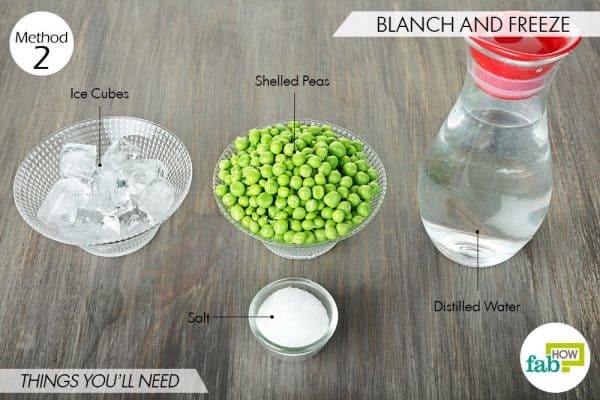 Add 1 cup of shelled peas to the salted water. Bring the water to a boil and let the peas simmer for 1½ minutes over high heat. Turn off the heat and strain out the peas in a colander. Set it aside and prepare the ice water bath. Note: You’ll have to be quick here. The peas need to be transferred to the ice water as soon as they are done boiling. Put 1 cup of ice cubes in a large bowl. Fill the bowl halfway with distilled water. 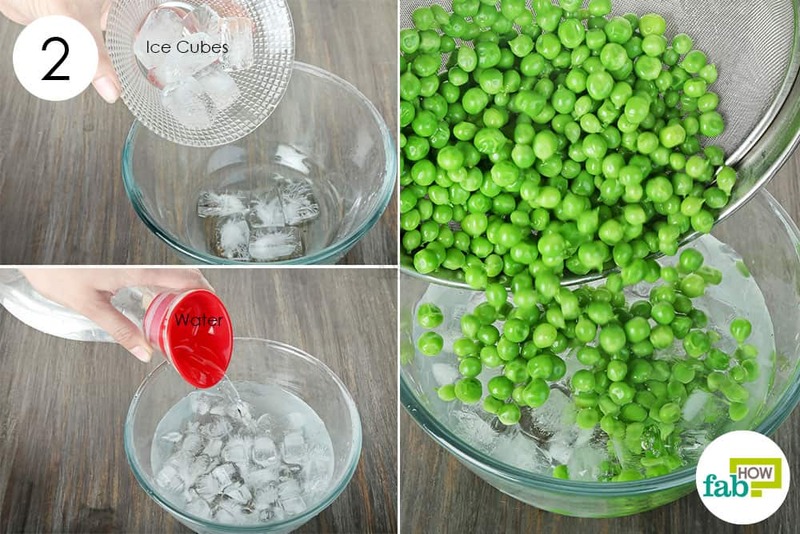 Quickly dunk the peas in the ice water and let them sit for 1 to 2 minutes. This will stall the cooking process and ready the peas for preservation. Strain the peas from the ice bath. Spread out a big sheet of paper towels over a baking tray. 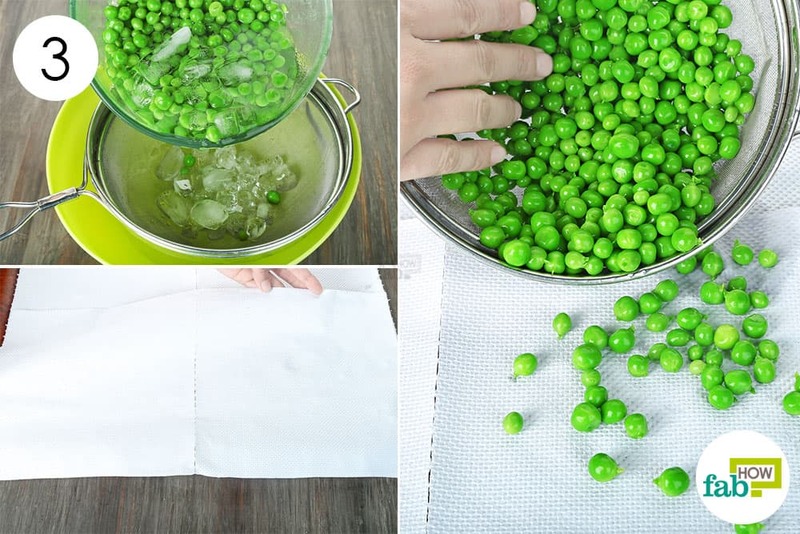 Spread the peas over the paper towels. Let the peas air-dry for not more than 1 minute. Pop the tray into the freezer to freeze the peas. 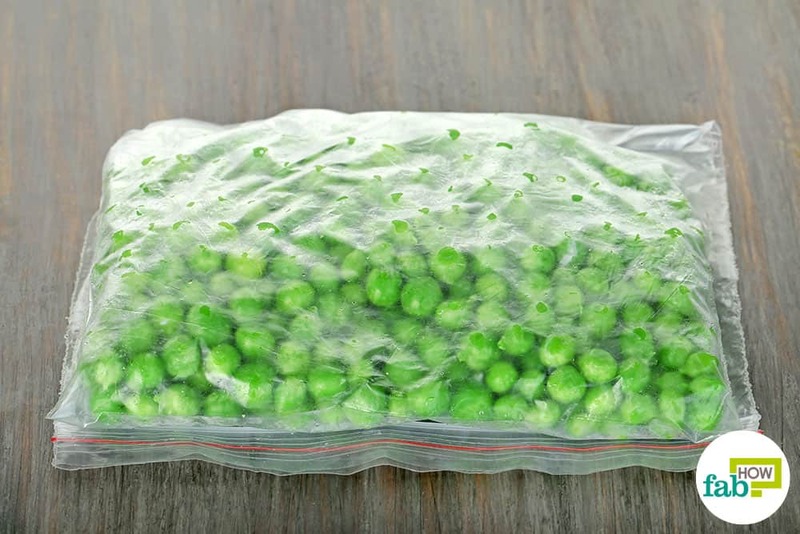 After 3 to 4 hours, you can transfer the peas to a ziplock bag and store them in the freezer until needed. 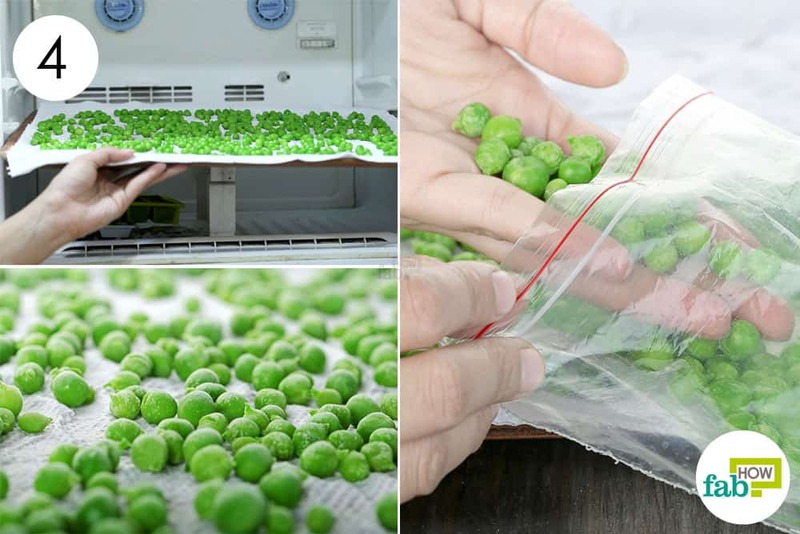 You can use the blanching and freezing method to store green peas for over 1 year. If you are unsure what quantity to buy, 1 pound of peas with their pods will give you about 1 cup of shelled peas. You can also wash the leftover empty pods and use them to make vegetable broth. You can also learn how to grow peas in your own garden. You need not thaw the frozen peas. You can add them directly to stir-fries, or boil or steam them and then add them to your dishes.